Recently Hubby, Youngest Daughter and I went to Downtown Disney. It was a Saturday night and we got there at dusk so it wasn’t too hot. They always seem to have musicians playing which adds a nice touch. We sat down to rest our feet and listen to a guitar player when we were approached by a survey taker. She asked if I would be willing to take a Disney survey. I was in a good mood so I said yes. She took my email address and said the survey would be sent to me, handed me a Micky Mouse sticker and we were done. A few days later the survey popped up in my in box. I had agreed to take it so I opened it up and started right in. Ten minutes later I began wondering what I had gotten myself into. I finally finished the dratted thing after wasting 30 minutes of my life on it. And what did I get from the multi-billion dollar Disney company for my troubles? A hearty “thank you.” They didn’t even offer to enter me into a drawing for something. No coupons, no little trinket. I guess the Mickey Mouse sticker was all the reward I was going to get. So if you are ever on a Disney property and someone approaches you about doing a survey, just say “no!” Say it fast and say it loud. I love all things Disney, but they need to thank their survey takers with a little more than a sticker! 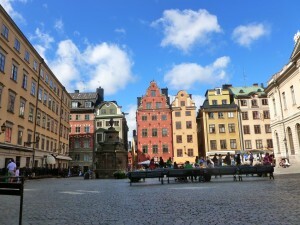 The last stop on our cruise in northern Europe was Stockholm, Sweden. This was a special stop for me because we were meeting up with someone I actually knew! As I have mentioned previously, I write local history books, stories, newspaper columns, etc….In the process of doing research for a book published last year I reached out to someone on Ancestry.com. She put me in contact with another family member who happened to live in Sweden. Last October Helene was visiting from Stockholm and I took her around to see the sites in the area. As she was leaving she said, “If you are ever in Stockholm…” Sigh, like that was ever going to happen! 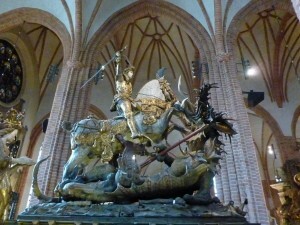 But then I remembered the cruise we were planning and, sure enough, it stopped in Stockholm! Helene met Hubby and I and took us on a tour of the oldest part of Stockholm. Isn’t this a pretty square? You would never guess that an event called the “Stockholm Bloodbath” occurred here in 1520! 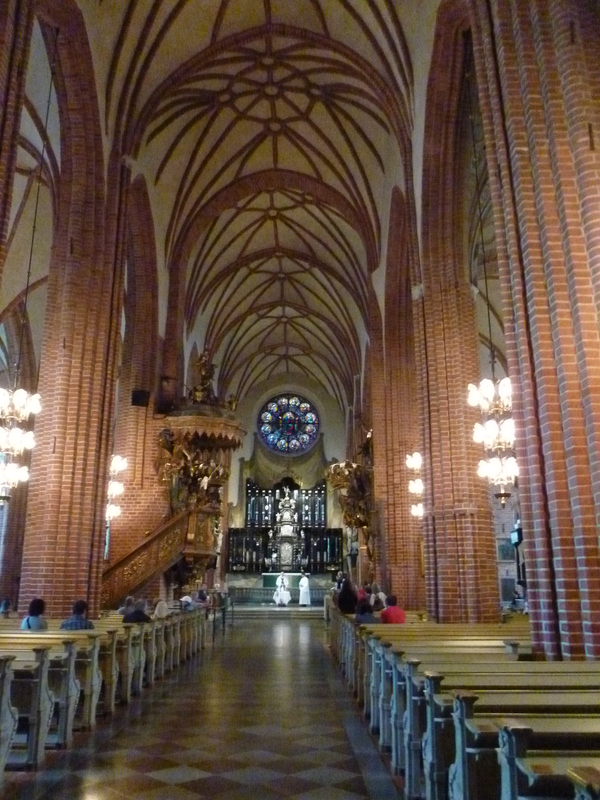 Looking down the aisle of the church of St. Nicholas, commonly known as Stockholm Cathedral. Many royal weddings are celebrated here, including the most recent weddings of two Swedish princesses. 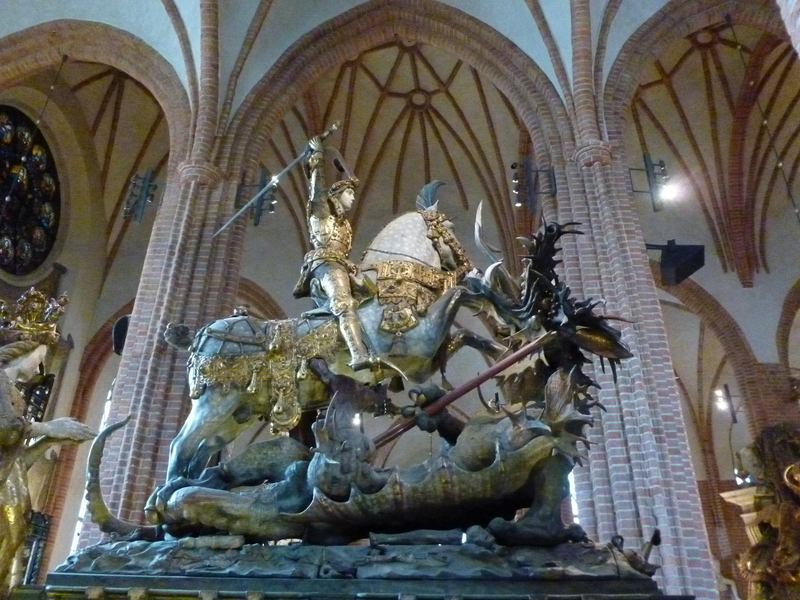 This carved wooden statue of St. George slaying the dragon dates to 1489. 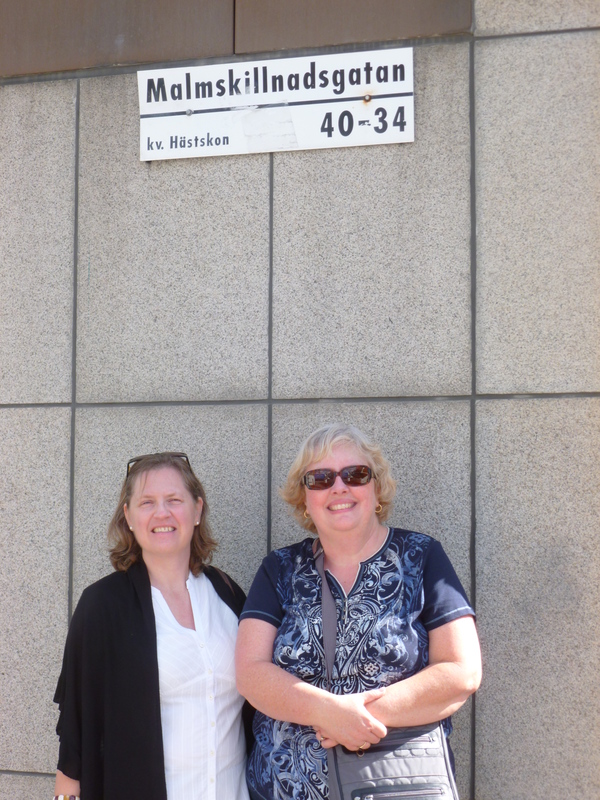 Here are Helene and I standing on the street where her ancestor lived before she came to America. Tragically, the story of Anna Baldwin, Helene’s ancestor, did not end well. But we like to think Anna would be pleased that almost 100 years later Helene and I became friends. I am not quite done with our vacation adventures! 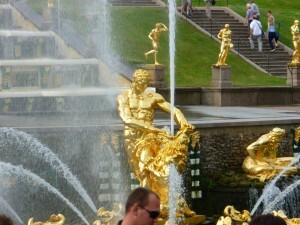 After our two very busy days in St. Petersburg, Helsinki was like a vacation! No worries about pick pockets, no need to kill ourselves with sight-seeing. Our friends had things they wanted to see and we had different things we wanted to see so we each went our separate ways. Also we didn’t take a tour at this stop so for the first time Hubby and I were really on our own, in a foreign country no less! 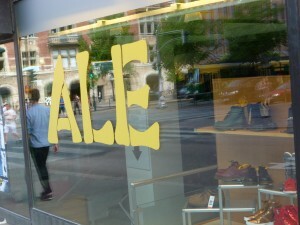 Of course we were in a Scandinavian country and the level of English spoken in Finland was pretty high. When we got lost we just asked and could usually find someone who could help us. It helped to have a map we could point to when the bus driver didn’t speak much English (and they usually didn’t). 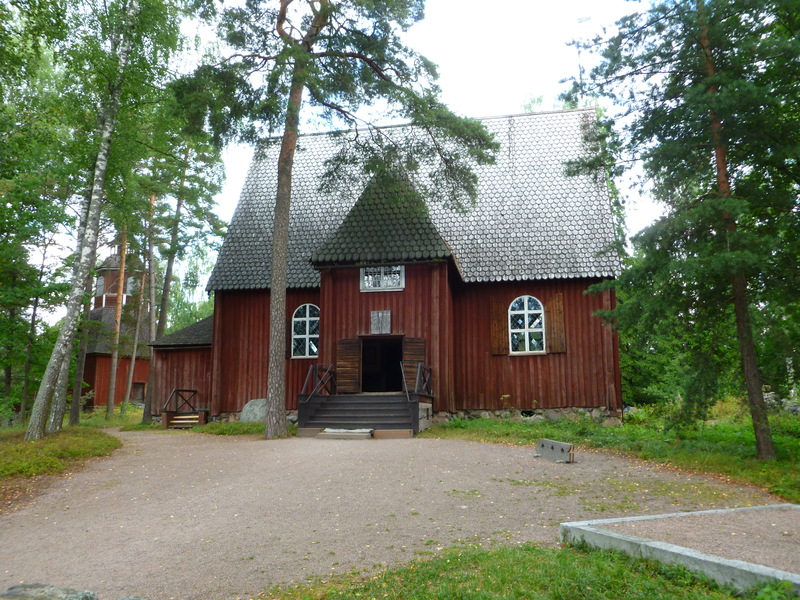 Hubby and I went out to the Seurasaari Open Air Museum where historic buildings from all over Finland have been preserved. It is set on an island covered with trees. After the two days we had in Russia, being out in a bit of nature was a wonderful change of pace. It was quite easy to get to on the Number 24 bus, once we figured that all out, Finnish not being a language we are familiar with! 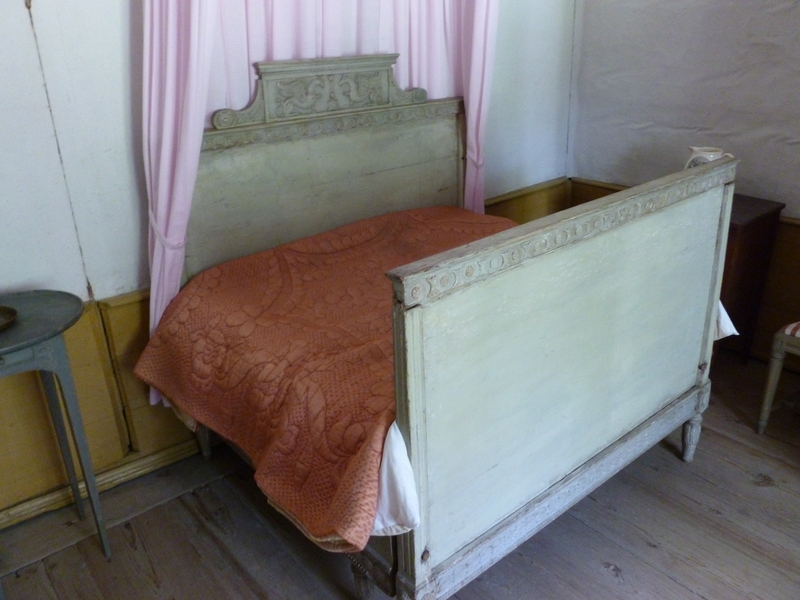 A couple of the houses had these funny beds that pushed in to make them smaller and pulled out at bedtime. 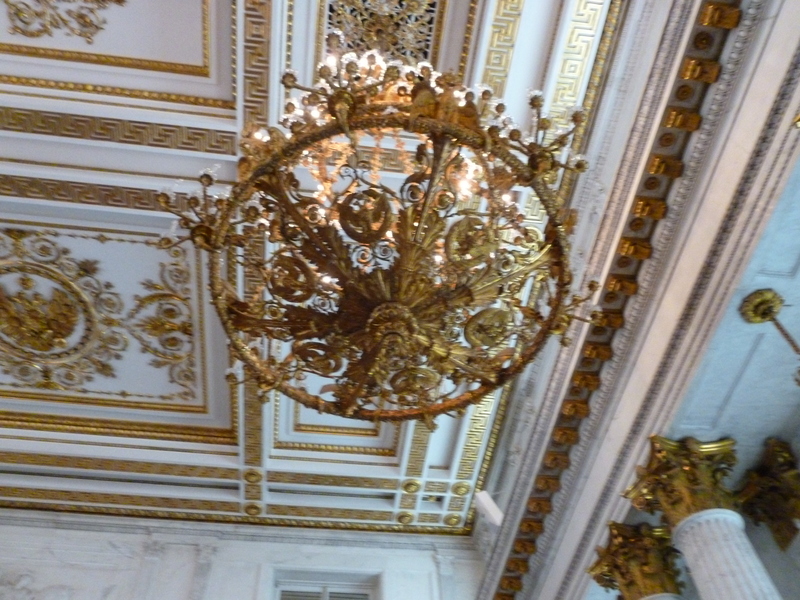 It was explained to us that people were into classical style arrangements where the furniture was up against the walls and there was a large open space in the middle of the room. In order to accomplish this in the bedroom they created these beds that shrank during the day to make more space. This church was quite old, dating to the 1500s I think. 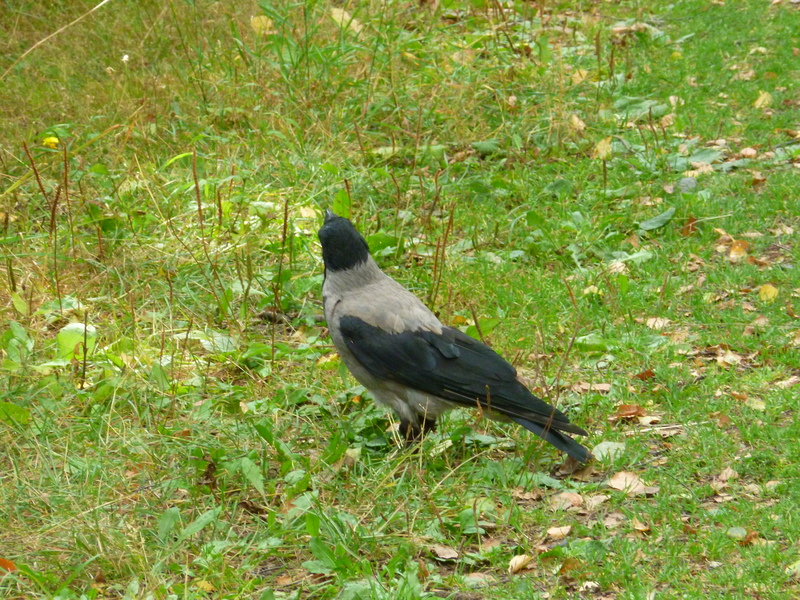 This is a hooded crow, which we saw in a number of places, but I managed to get a photo of one while we were at the open air museum. 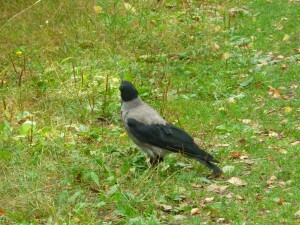 They looked like the black crows we have here in California but were pretty black and gray. 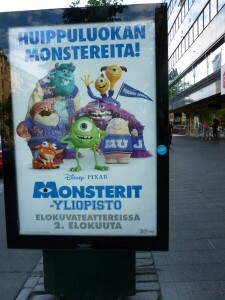 I thought it was funny to see a poster for Monster’s University in Finnish! Back in the city, we had a bit of a problem figuring out where to catch the bus back to where our ship was docked. We imposed on a young man who used his smart phone to tell us where to catch the bus. We walked over to where he said to go but you know how bus stops can be. There you are on a street with just a pole and a sign to tell you that a bus stop is there. It always makes me nervous. Is it really the right stop? We saw the bus coming and I thought to myself that I would show the bus driver my trusty map to make sure it was the correct bus. Then, as the bus pulled up in front of us who should I see sitting inside waving at us but our friends, Barb and Jim, coming back from their adventures. Then I knew I was at the correct stop! When we left to go on our vacation at the beginning of August my area was experiencing some pretty nice weather. That changed while we were gone and ever since we got back almost 5 weeks ago it has been so so hot. We have been running that air conditioner like we have money or something! Just a couple of days ago that changed. The evenings have cooled off and we have been able to open the windows to let the cool night air in. The AC has had a well deserved rest. It has been delightful! I know that we will have another heat wave or two before fall finally arrives completely at the end of October. But I sure am enjoying this cooler weather. I might actually clean the garage if this keeps up! We just took a quick two night trip to the beach with our girls. They have done things this summer, and we did one big thing this summer, but we haven’t done anything together. Youngest Daughter moves back to school in 2 weeks , so we decided we better get our act together! While I was there, I was noticing things that are different at the beach than at our home in inland So Cal, even though the two places are less than an hour and a half apart. For one, we just don’t have any stores that advertise food as “raw, organic, and cold pressed.” We get the “organic” word thrown around at our local grocery stores a bit, but never, and I do mean never, in conjunction with raw and cold-pressed. I am not sure I even know what that means…. My city doesn’t really have a downtown, but the big city next door does. However, no matter how many times I am there, walking around, I don’t see Hare Krishnas marching around, pounding on drums, shaking tambourines, and singing. Just doesn’t happen. Maybe that particular religion needs humidity to survive? It is a lot easier to walk, bang on drums, and sing if it is 83 degrees instead of 102 degrees. A restaurant that specializes in $30 or more meals is a fancy night out for us. At the beach that is just a regular dinner. Sigh…..
People who have money choose to live at the beach. Money means more expensive cars. Hubby, who loves cars, has a great time watching traffic go by. We just do not see Ferraris and Maseratis back in our neck of the woods. So after our little get away we are back in our warm inland valley. It was nice to be at the beach but it is nice to be home as well. 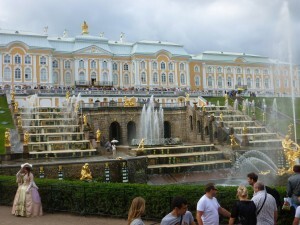 After our big first day in Russia we rested, we showered, we slept, and then we went out the next day to see even more! Happily, it cooled off a bit the second day so it wasn’t quite as grueling to do a day of sight-seeing. 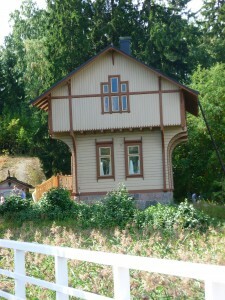 The main destination on the second day was Peterof Palace. 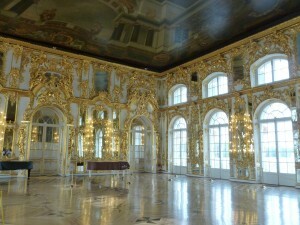 There can never be too many palaces and too much gold leaf! We were not allowed to take photos inside the palace, so I am going to show you what we saw outside, which is pretty darn amazing! We entered the gates and this is what we saw. Another huge and amazing looking palace. Here is a closer view. Like the other Russian buildings we saw this one had white accents, this time coupled with tan paint. If you are a Tsar, you can build a canal which brings your personal ship from the river right up to the back door of your palace. 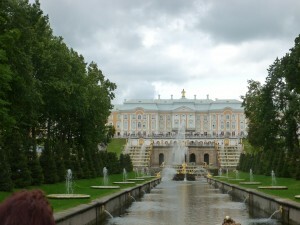 This is the view from the back of Peterof Palace looking down the canal to the river. We walked down to the river and hopped on a boat ourselves, which took us back to St. Petersburg. Pretty amazing view, isn’t it? At the head of the canal is this spectacular fountain. Who says gold leaf is just for indoors? 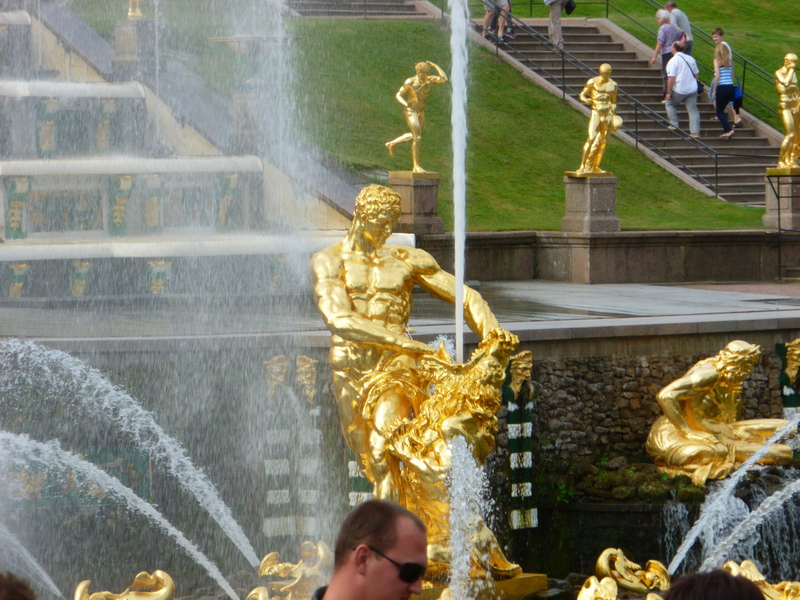 Here is a close up of one of the figures that decorate the fountain. 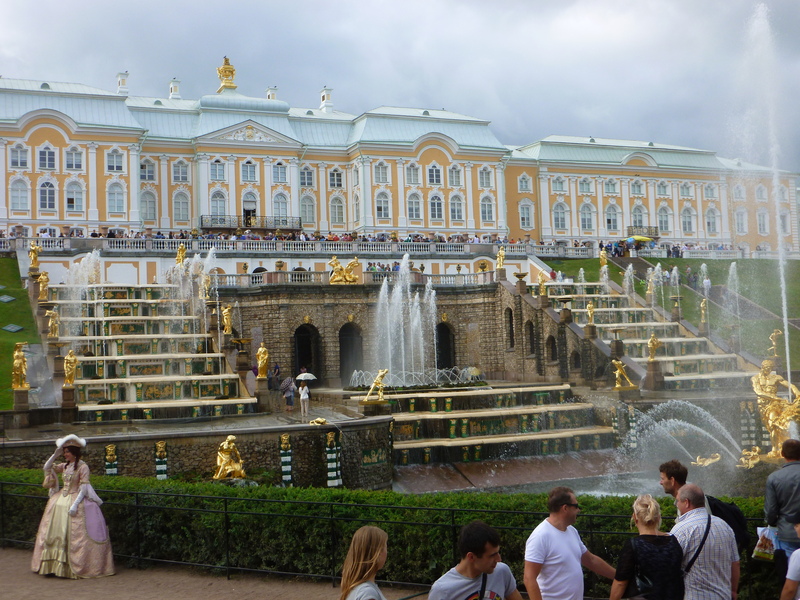 One last look at the rear of Peterof with the fountain below and the canal. I am not sure whose head that is in the corner….not anyone I know! My family and I talk about this billboard every time we see it. We are puzzled why our local McDonald’s is advertising that they have what 99.9% of McDonald’s in America have. Really? A lobby? Wow! That makes me want to go there! And a drive thru, no less! OMG! I must get off the freeway now! But the whipped cream on the sundae are the restrooms. So unexpected at a McDonald’s. Note they don’t try to lure you in with the promise of “clean” restrooms. All you get is restrooms, and otherwise you take your chances. But heck, along with the lobby and drive thru, how can you resist the siren call of this obviously amazing McDonald’s? 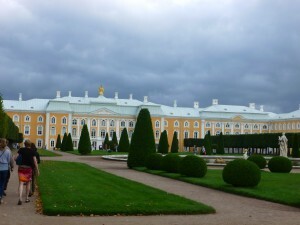 In my last post I showed you Catherine’s Palace, otherwise know as the summer palace. 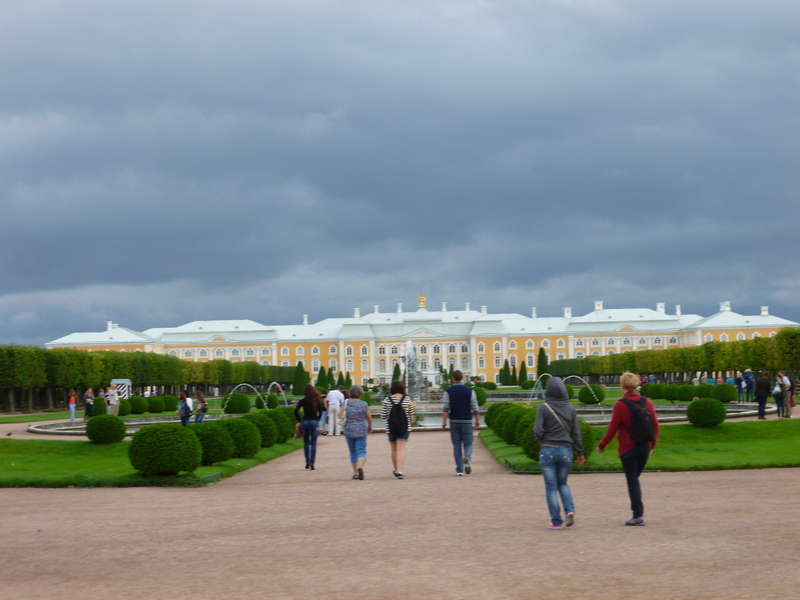 Later that same day we went to the Hermitage, which is in St. Petersburg itself. 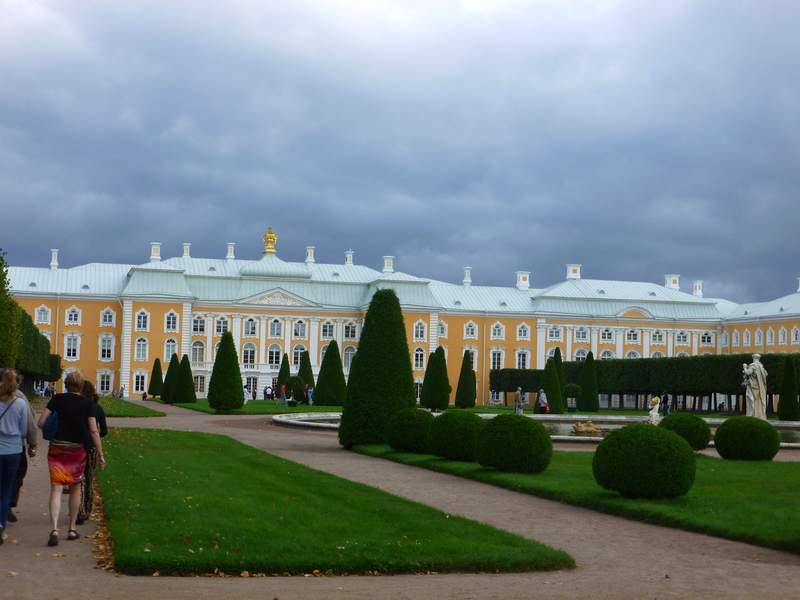 It was the winter palace. 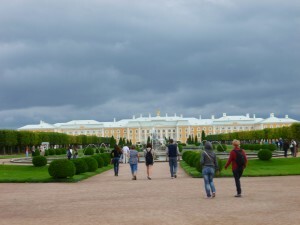 The Hermitage is now one of the most famous art museums in the world. We saw only a tiny smidge of the art on display. The tour guide said it would take something like eight years to see if all, if you came every day of the year for 8 hours a day and spent one minute with each item. 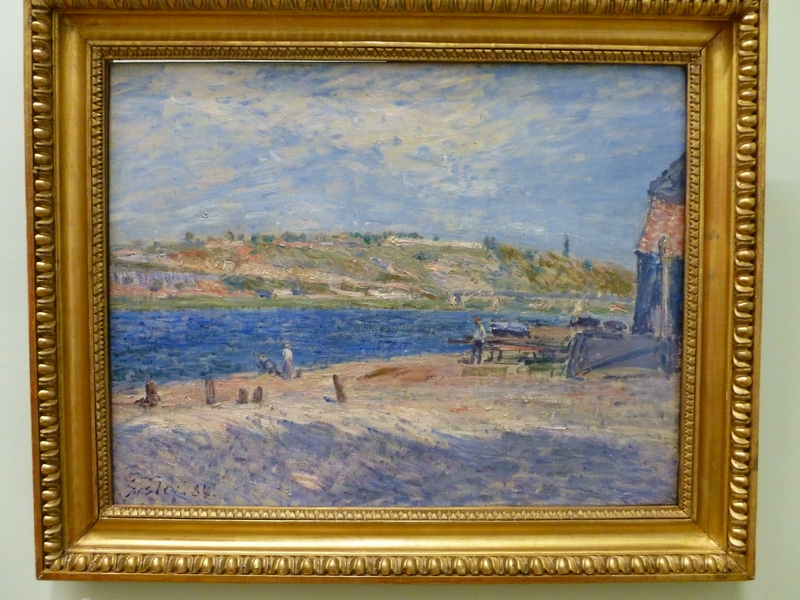 Well, that won’t be happening so I guess I will have to be satisfied with the French Impressionists, which is the area we were set lose in. Oh, that and the bathroom. I saw that, too. 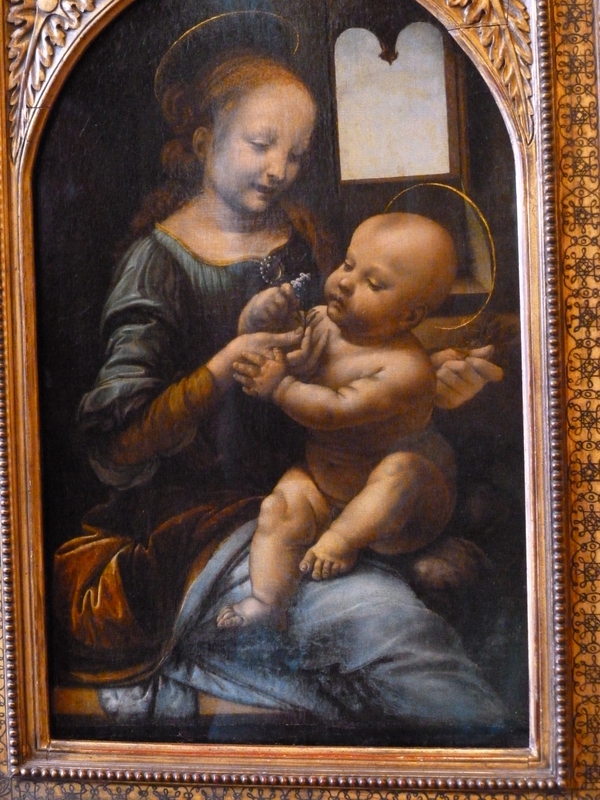 But there wasn’t any art work in there…. Here are a pair of leather shoes and one white sneaker. 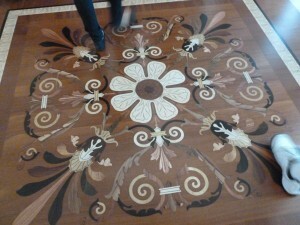 But ignore the shoes and look at that magnificent floor! But I did more than look down, I looked up, too. Of course, when I looked up I saw gold! 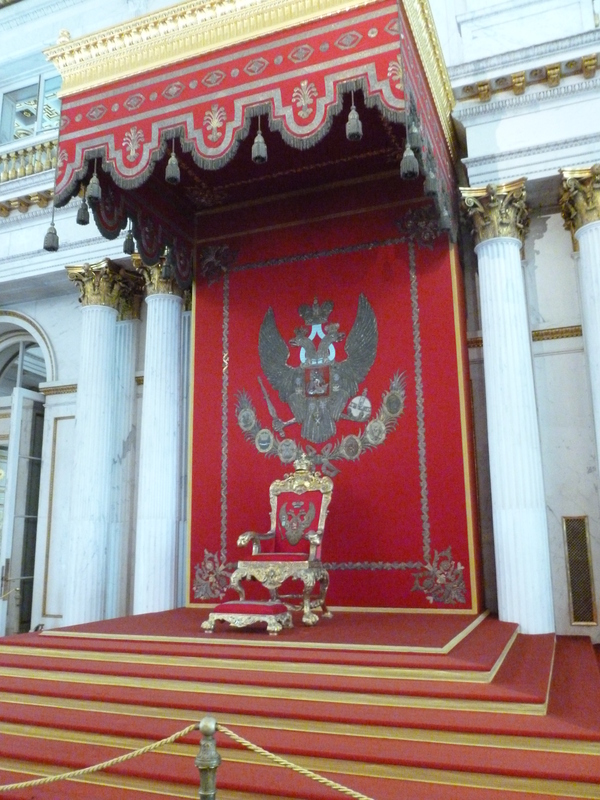 Here is the Tsar’s throne. Note the Russian Eagle behind the throne. 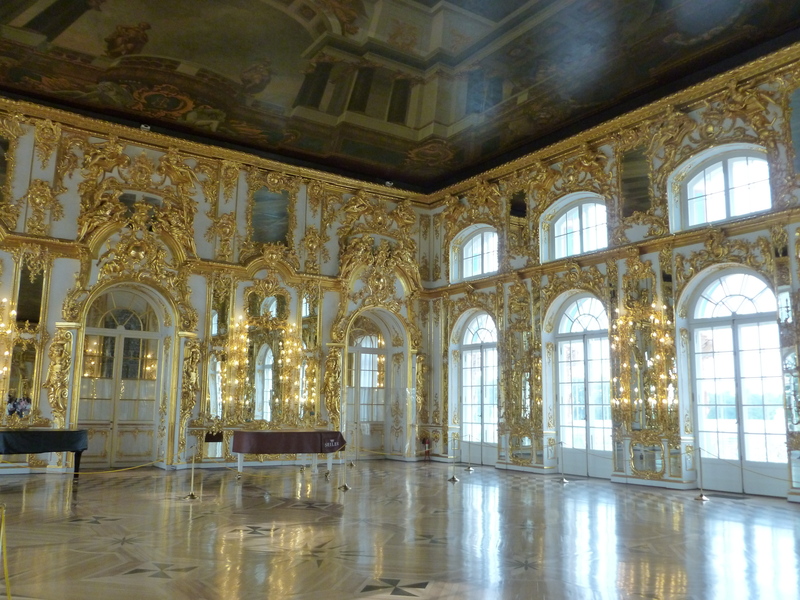 The Hermitage was built on a spectacularly large scale. I hope you can get an idea of this from the photo below. But the Hermitage is not about being a palace anymore. It is about being a home to magnificent art. 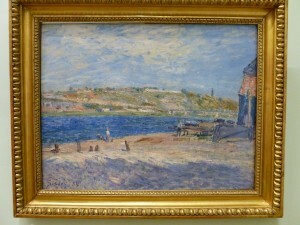 Below is a Monet. 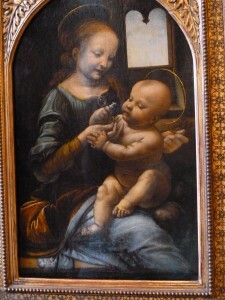 We also saw a DaVinci, one of two at the Hermitage. As the day wore down, we were two tired, warm tourists, but not too tired to get our photo taken in front of a huge urn, one of many we saw that day. 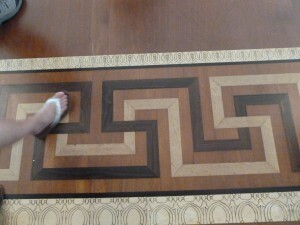 It was covered in some type of semi precious stone, but done in such a way as to look like solid stone. And then it was off to collapse on the ship in blessed air-conditioned comfort! 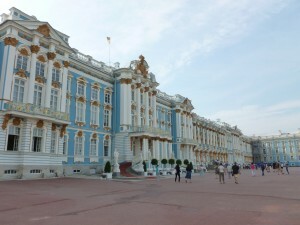 The main reason I wanted to take a Baltic cruise is because I wanted to see St. Petersburg, Russia. The rest was just frosting on the Russian cupcake, so to speak! So I was very excited to finally get to Russia. Being the age I am, Russia was a place I thought I would never see because I was not going to deal with all of that communist cold war nonsense to visit that country. So the end of the Soviet Union cleared the path for me and Hubby to see at least a small piece of Russia. 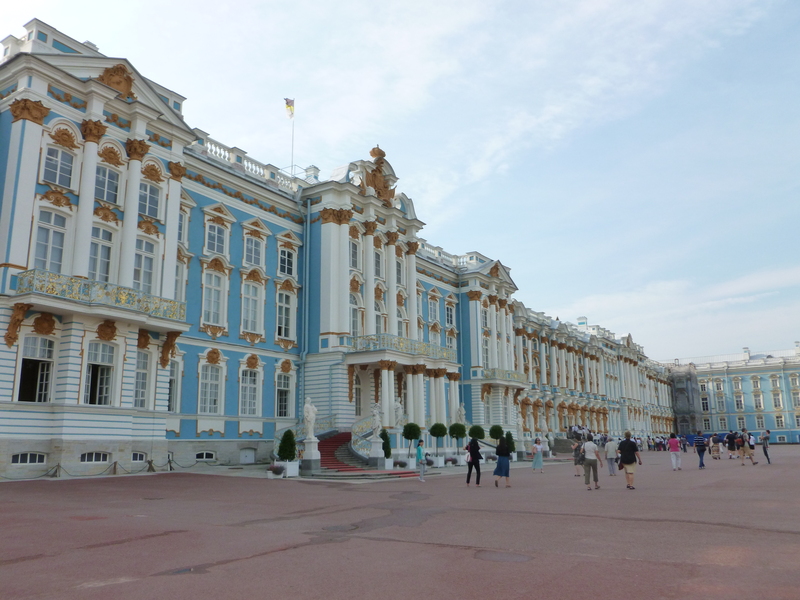 St. Petersburg was founded at the mouth of the Neva River by Peter the Great in 1706, so everything in the city is no older than the early 1700s. It was also built on the many islands that are located at the mouth of the river and, like Venice, has many canals. 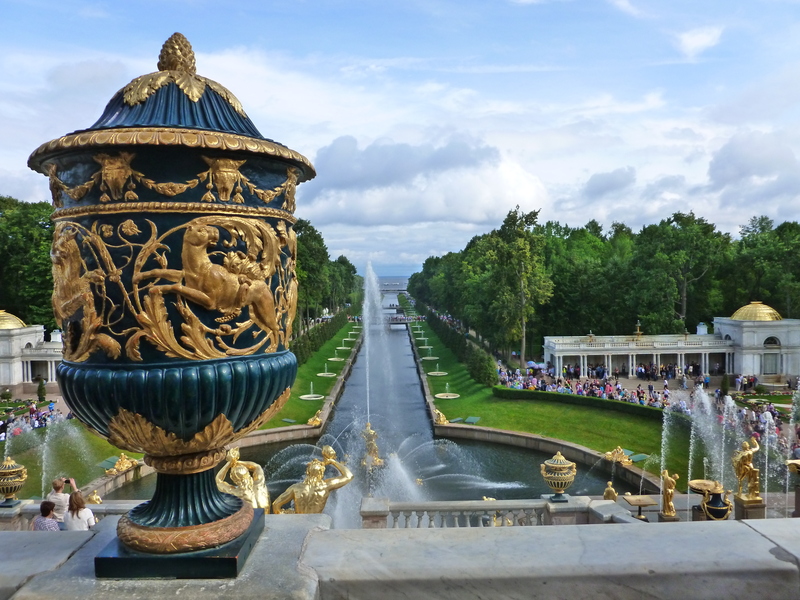 There are a large number of palaces in and around St. Petersburg because Peter the Great expected all the noble families to take up residence in his new Russian capital. Oh, so much to see and only two days to see it in! I have been saying all along that one of my main goals on this trip was to see onion domes in their native setting. 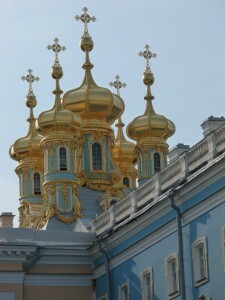 So here are my first onion domes seen while standing on Russian soil. These beautiful domes are on top of the private chapel at Catherine’s Palace, which is located in Pushkin, about an hour outside of St. Petersburg. 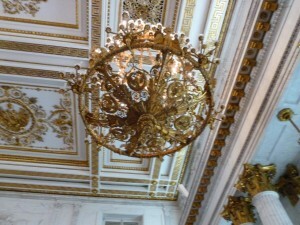 It was the summer palace, so keep in mind that the opulence you are about to see was in use only a few months a year. As you can see from the photo below. the palace was huge, even if it was just the summer place. No surprise there, I guess. I think it was a Russian Tsar who coined the phrase “Go big or go home.” On thing that struck me over and over again was the fact that Russian’s love their color. As you will see from my photos we saw many many buildings with bright-colored paint and white moldings around doors, windows, etc…. 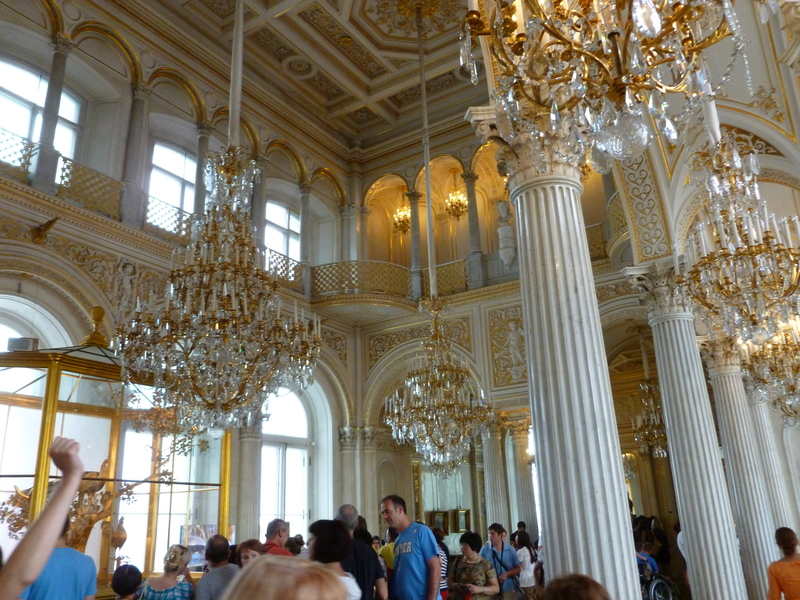 Almost every room was decorated with gold leaf, so much gold leaf. It as truly spectacular and amazing. 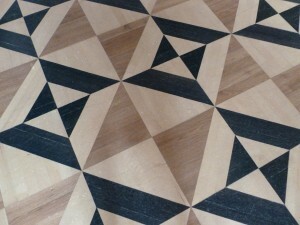 I think, however, I was most fascinated by the beautiful wood floors. 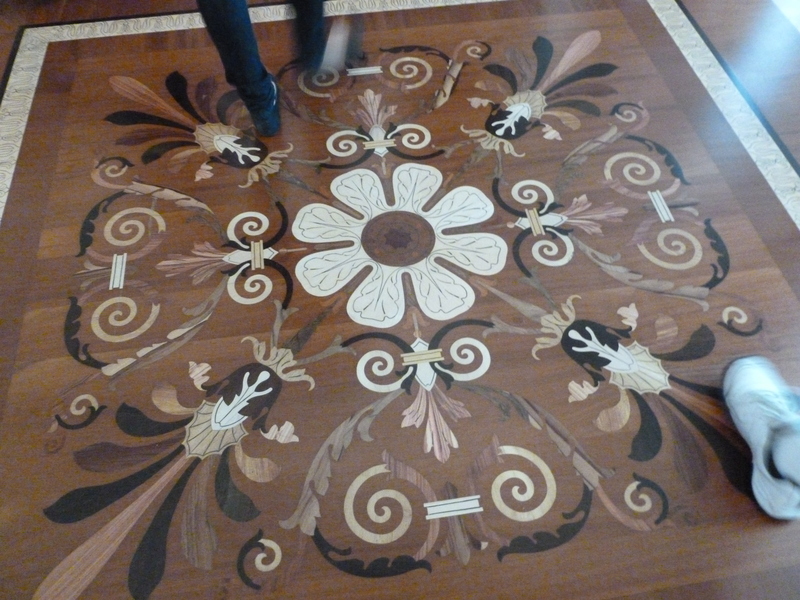 The floors were made with many different natural colors of wood. They were not painted or stained. I think why I took so many pictures of the floors was because I could relate to them better than the gold. 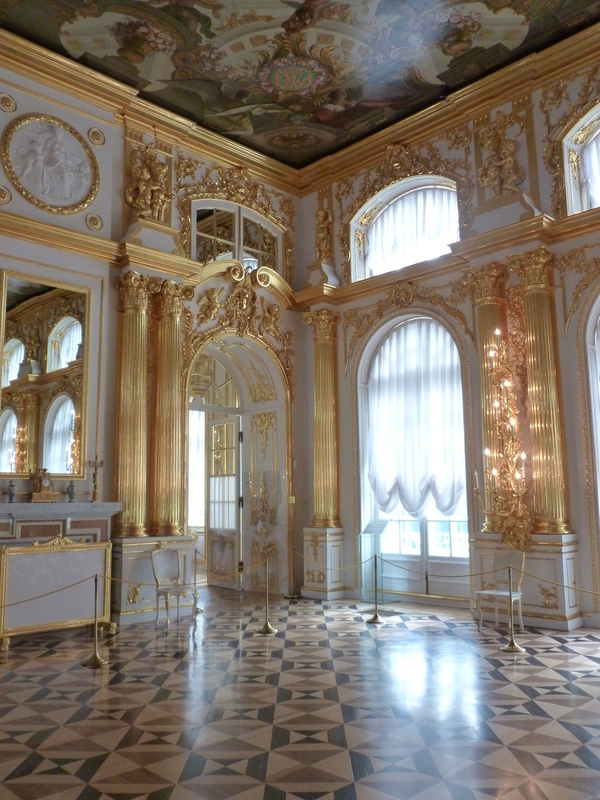 I will never have gold leaf all over my house, but I might have nifty wood floors….just like Catherine the Great! I know, only in my dreams…. 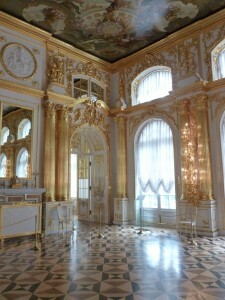 Yet another room, yet more gold leaf…so amazing! 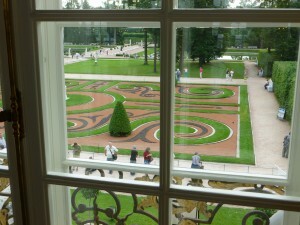 As we walked down a hallway I looked out the window and saw this view into the garden. the same view that the tsar’s of Russia saw. I love going to historic places like this! 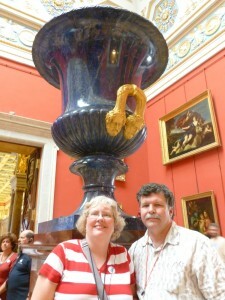 We saw so much in Russia that I am afraid I am going to have to break it up into a few separate posts. I hope you are enjoying the armchair tour!